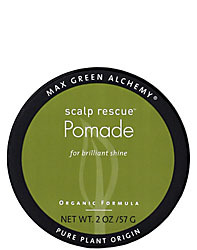 Scalp Rescue Pomade creates brilliant shine in a modern oil-based extra rich formula. Pure organic jojoba oil and shea butter moisturize the scalp and deep condition the hair leaving it feeling soft and smooth while organic olive and coconut oils impart a super gloss. With our signature aroma from pure lemon tea tree, tea tree, geranium, lavender, and rosemary, this pomade is perfect for use by men and women alike because these essential oils are known to promote healthy scalps. The unparalleled Pure Plant Origin formula is vegan, color safe, gluten, PVP and alcohol free. The pomade does not impart hold but can be used in tandem with any of our other styling products. Men love this as a traditional barber shop purchase, and women love it for its rich nourishment - we guaranteed that! A little goes a long way! Apply a small dab to the palm of your hand then rub palms together briskly to emulsify then apply to dry hair working pomade through. Repeat with more pomade if desired. TIP: Can be used overnight and shampooed out in the morning for an extra deep conditioning treatment. Before styling we recommend washing with our award winning Scalp Rescue Shampoo and then moisturizing with Scalp Rescue Conditioner for strong and manageable hair. We also suggest that you avoid using other brands which may contain silicone derivatives that reduce the benefits of Scalp Rescue. I love this Pomade! Usually you associate the word Pomade with Heavy, but this feels great and light on the hair but it also Holds and Shines even thick corse hair. I use Hot Rollers and hate using hairspray especially in humid weather and this gives hold and prevents frizziness. Great for Flat Irons and the Straight Look. LOVE LOVE LOVE THIS POMADE! I love this product but I have one criticism. The consistency changes half way through the jar. The top half provides just the right amount of hold and shine without being oily. But the second half is oily with considerably less hold. In fact it is almost a different product. I wish there was a way to make it consistent throughout. MGA says: "Our pomade does not contain a fixative agent to provide hold. For the right combination of shine AND hold try our Scalp Rescue texture paste." I love this. Used it years ago, but was always wanting to try something new. Well, I''m back because I don''t even need a conditioner. I apply it to wet hair and style. I get compliments on the softness and shine of my hair. I''m 69 and have been coloring my hair for years. Also, I have allergies. I highly recommend it. My hair is fine and so curly. This is the best product I''ve found to keep the frizz down and my hair looking smooth. It''s the best! Should I eat it or put it in my hair? Smells so good you want to gobble it up...but helps tame frizzy hair, give any hair more luster or help detail that piecey look. Scalp didn't feel itchy as compared to other pomades. Though hold isn't as strong, but it's relatively decent. At least the trade off of weaker hold for a healthier scalp reduces the risk of having a clogged oily scalp. Will definitely buy again! Sooo. . .while this Pomade is really great for keeping my husband and my hair looking shiny and healthy (a little goes a LONG way. . .I gave a jar to my husband last year and he came to me a few weeks later saying he loved using this on his feet at work. He is an iron-worker and using the balm keeps his toes from getting rubbed raw from friction in his work boots. He's tried everything and this is the one thing that really works for him as well as keeps the skin on his toes healthy. Now it's the ONLY thing he will use. So. . .great for hair. . .amazing for work-boot wearers. I just want to say how much I love the smell of this pomade! >_< The combo smell of the shampoo, conditioner and pomade on my hair is just out of the world. I am constantly caught by myself holding up my hair to smell it :p But this is just me as smell is a very personal thing. The pomade did make my hair smoother, shiner. easier to manage and softer. The shampoo, conditioner and pomade will be my staple for my everyday routine. Please don't ever stop producing such awesome products, MGA! Will try their styling products next! Scalp Rescue Pomade gives you shine without oiliness and it smells great too! I mix a little with Scalp Rescue Sculpting Gel and style away! A little goes a long way when using it as a styling product. I love the smell and how easy it is to use. It is great for dry hair and itchy scalps. A little goes a long way. Use sparingly, especially if you have fine hair, as it can make it look stringy. Still, love the product.